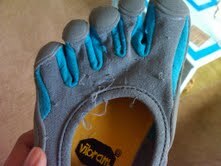 WTF Happened to My Toe Shoes?? Soooo, I wake up yesterday morning, ready to don my toe shoes for my P90x KenpoX workout. I pick up the left shoe and begin to freak out: Dadli, my cat, attacked my toe shoes. WTF? I picked up my scarred toe shoe, ran to the living room and proceeded to wave the shoe and yell at Dadli like a madwoman….doesn’t she know how much these things cost? Dadli was smart… she fled the scene immediately. I knew something sinister was going through Dadli’s mind when during my abs workout two days before, I saw her looking at the toe shoes funny; her beady little eyes were following every movement of the shoes. I checked on the shoes this morning and they don’t seem to have endured another attack. Did I get through to Dadli? Only time will tell. lol. I guess you toes look like little mice to play with!